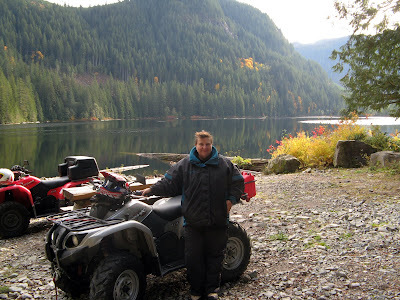 After Wayne and I came to Powell River, we wanted to explore the back country. Since our good friend John had a quad, we thought it would be a good way for us to learn about our new home. Following John has taken us to some really beautiful places. I started with a small Honda Recon 250 (229cc). It was bright red and really easy to ride. I loved the way it handled and it took me almost everywhere the other guys with 4X4 could go. I rode it for two years before I decided to get a new bike. 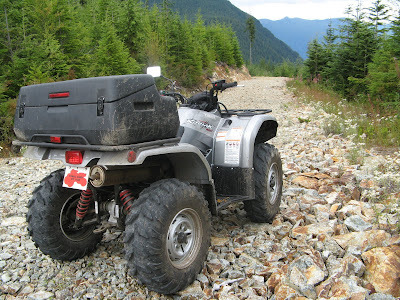 My new quad is a Yamaha Kodiak 450 4X4. The model is now called a Grizzly 450. 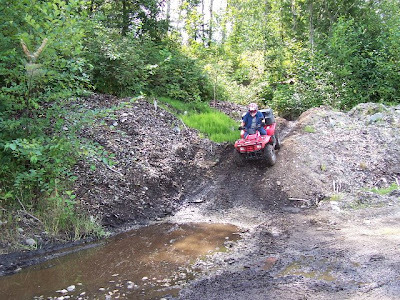 With my little Honda I had to take a running start to make it up some of the steeper hills. With the extra power and 4X4, I can now crawl up slopes in a safer manner. And the automatic transmission is a nice feature. If you move up to the 550 you can also get power steering. 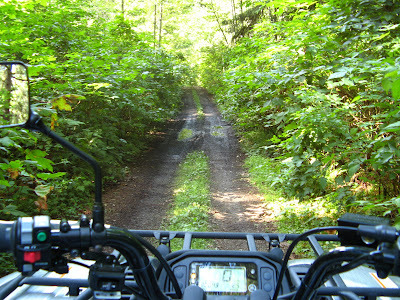 Here are a few of the wonderful quad trails in Powell River. And here's one of my YouTube videos for your viewing pleasure. If you've been following my posts, you know that we are driving a U-haul truck north from Pomona, California to Bellingham, Washington. The next leg and stage in my life is leaving California. I was something of a rarity in Los Angeles, a second generation resident. While my grandparents and were immigrants from England and Ireland (via Canada) and Norway, both of my parents were born and raised in Southern California. But now it's time for me to leave it all behind. Wayne and I have fallen in love with Powell River, BC. 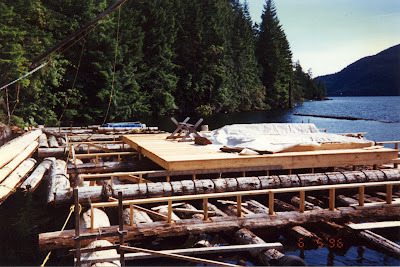 Home for us now is our floating cabin on Powell Lake. But meanwhile, we need to get all (at least most) of the stuff we've accumulated up north. The first day of travel was completely within California. It's 770 miles (1,239 km) long with 690 road miles (1110 km) from Pomona to the northern border. But our little truck had lots of fun running with the big guys. Our first night brought us to Redding. The next day we finally crossed the California border and then on up to Portland, Oregon. From Redding to Medford, I-5 passes through some beautiful territory. Most impressive is Mt. Shasta and the Castle Crags. After the flat farmland of California's central valley, it's an awesome sight. I've lived most of my life in the suburbs of Los Angeles. I was born in "Rural Compton," or so states my birth certificate. There's nothing rural about it any more. But before the 1950s, my grandparents had a farm there. They raised corn, beans and other crops to sell at the downtown LA market. My grandfather was also a sharecropper and grew hay near where the La Brea tar pits were later excavated for dinosaur bones. Those must have been exciting days. I moved around some (Torrance, Lakewood, Cerritos, Pomona), but never strayed far. Today it's official, I'm leaving Los Angeles. Wayne and I climbed in the U-Haul truck and started driving north at 8:45 a.m. It was an auspicious day for more reasons than that. We remarked that we would always remember where we were when Barack Obama was sworn in as the 44th President of the United States. We were driving on the Foothill Freeway heading out of town. When I was little, my parents and I would travel to Modesto, California, to visit my grandparents at least three times a year. In those days, there weren't freeways all the way and we had to leave very early to get out of the city. I always begged for them to wake me up at the "waterfall." That's what I called the spillway (Cascades) for the Los Angeles Aqueduct near Sylmar. Today, the waterfall was running at full force in my honour just to say good-bye. We drove I-5 all the way to Redding. Wayne took the first leg to Harris Ranch where we got gas and lunch. It's a bit of a tourist trap, but the food is good. While we were there, we got to see our new President walk up Pennsylvania Avenue to cheering crowds. I took the second leg. There's not much scenery along I-5 until you reach Stockton. Then you pass right through downtown Sacramento. Unfortunately, Arnold was too busy with the budget crisis to come out and wave good-bye. 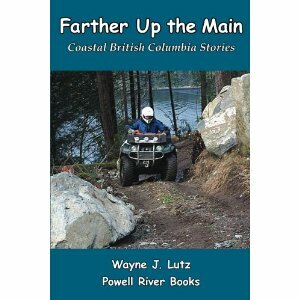 Over the last several weeks, I've introduced readers to Powell River, BC. This week I want to invite you to come up the lake with me to see my real world. 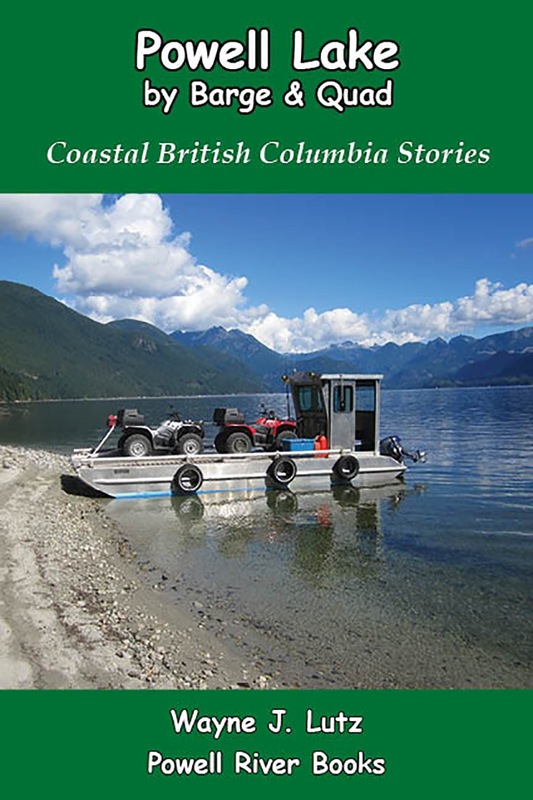 In 2000, my husband and I discovered Powell River while on a flying vacation to Coastal BC. We returned in 2001 to look for property, but found something even better. 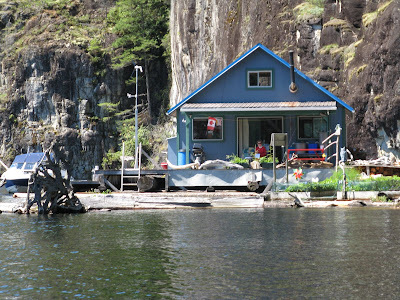 Powell Lake has a unique floating cabin community. 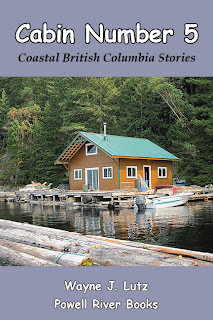 There are just over 250 cabins spread along the 300 kilometres of shoreline, all built on cedar log floats. Fortunately, the best cabin on the lake was for sale (at least we think so). In the beginning, we could only visit our cabin on holidays and during summer vacation. Now we live there almost full time. Summers are great! The weather is warm, there's lots of sunshine (with a little rain in between to keep everything green), and you can swim and fish right off your deck. But the winter is a special time at our cabin. 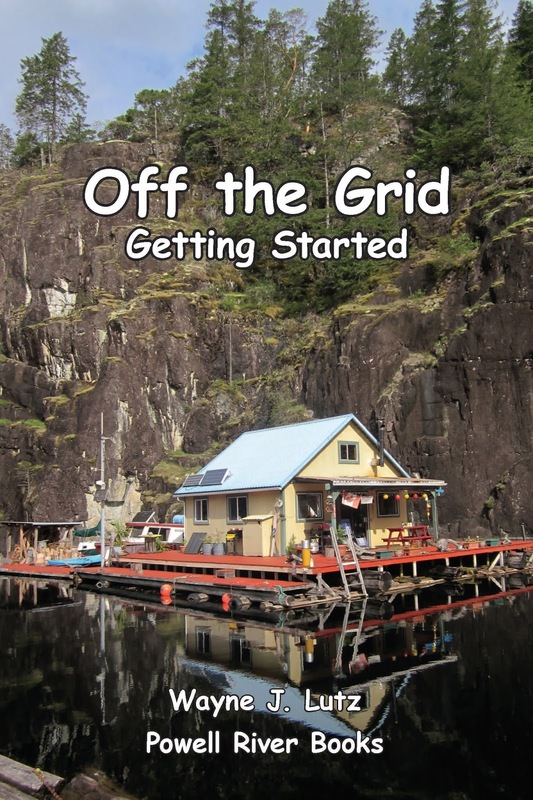 It's more private, the weather is exciting and we love curling up in front of our wood stove.